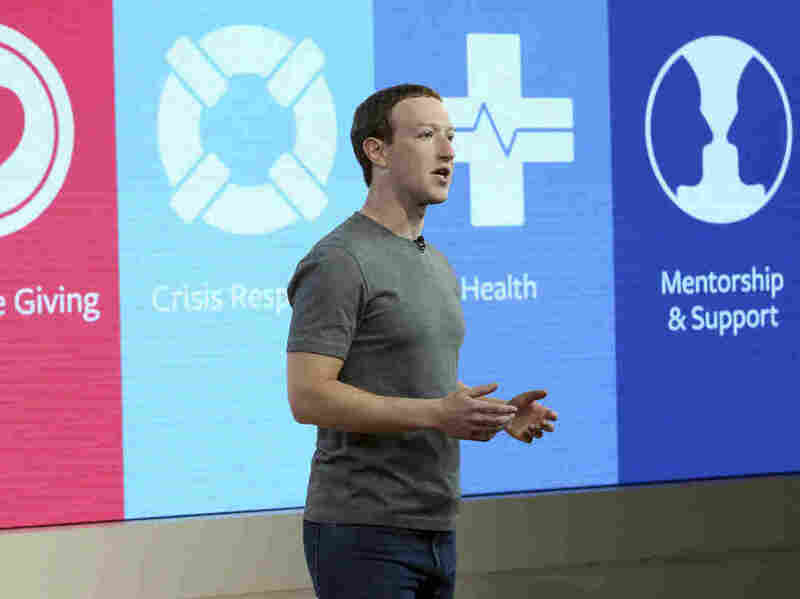 Zuckerberg Breaks Silence, Promises To Protect Facebook Community : The Two-Way Facebook CEO Mark Zuckerberg posted his first responses, followed by a CNN appearance, after the controversy surrounding reports that Cambridge Analytica exploited users' data without their knowledge. Mark Zuckerberg, Founder, Chairman and CEO of Facebook. Facebook CEO Mark Zuckerberg appeared open to limited government regulation of some activities of his company, as he fielded questions about reports that Cambridge Analytica exploited Facebook users personal data to influence the U.S. elections. "I'm not sure we shouldn't be regulated," he said on CNN during a rare interview. "I actually think the question is more, what is the right regulation, rather than yes or no, should it be regulated?" Zuckerberg said one area that could be regulated on the Internet is ad transparency. "People should know who is buying the ads that they see on Facebook and you should be able to go to any page and see all the ads that people are running to different audiences," he said. The interview came after Zuckerberg had issued a lengthy post Wednesday on his personal Facebook page promising to protect the data of platform users. He said Facebook will provide users with tools to show who has access to their data and how it is shared. Facebook will also "restrict developers' data access even further to prevent other kinds of abuse." "We have a responsibility to protect your data, and if we can't, then we don't deserve to serve you," he wrote. But unlike in his Facebook post, Zuckerberg offered an apology to users in his CNN interview. "This was a major breach of trust and I'm really sorry it happened," he said. Zuckerberg's comments followed several days of public silence about the Cambridge Analytica controversy. In his post, Zuckerberg first said there was a "breach of trust" involving Cambridge Analytica, Facebook, and a Cambridge University researcher named Aleksandr Kogan, who created an app to collect data that was later shared with Cambridge Analytica. "But it was also a breach of trust between Facebook and the people who share their data with us and expect us to protect it. We need to fix that," he wrote. Zuckerberg said Facebook will restrict third-party developers from accessing data beyond names, profile photos and email addresses. The company will also require developers to sign a contract before asking Facebook users for access to their posts or other private data. Users will also see a tool at the top of their news feeds showing the what apps they have used and will have an easy way to revoke the apps' access to their data. "I started Facebook, and at the end of the day I'm responsible for what happens on our platform. I'm serious about doing what it takes to protect our community. While this specific issue involving Cambridge Analytica should no longer happen with new apps today, that doesn't change what happened in the past. We will learn from this experience to secure our platform further and make our community safer for everyone going forward." Sen. Richard Blumenthal, D-Conn., a member of the Senate Judiciary and Commerce Committees, said he was not satisfied with Zuckerberg's statement, calling it "damage control." "This very superficial mea culpa makes even more necessary his appearing before the committee. He has to be questioned, perhaps under oath. Documents need to be subpoenaed. We need to know how Facebook is going to really protect privacy if it continues with the present business model of selling personal information. "There is a dilemma here unless Facebook is informing people about what access there will be to that personal information and enabling them to opt out. Explicitly opt out. In fact, they should be given the opportunity to decline to opt in. This kind of consumer right ought to be the subject of questioning before a congressional committee, likely the Commerce committee where I sit." Zuckerberg, in his CNN interview said that he would be willing to testify before Congress "if it's the right thing to do," suggesting that another Facebook representative might have more expertise on "what Congress is trying to learn." He said, "If that's me, then I'm happy to go."